The Damascene Blog: Did She? She became the ruler of a small Roman colony in the Syrian desert and wanted to turn it into an empire. Zenobia, the Arab queen of Palmyra, declared independence from Rome and defied that third-century superpower. She won battle after a battle, united Syria under her rule, invaded Asia Minor and reached the frontiers of Egypt. Her glory was not to last, though. The Romans marched in great armies, defeated the Palmyrans at Antioch, conquered Palmyra and left it in ruins, taking the Lady of Victory into captivity. But what happened to Zenobia after her capture remains a mystery: Was she really made to walk in the Emperor's Triumph in Rome, chained and humiliated? Or did she, as some historians claim, committ suicide before that? I hope she did. 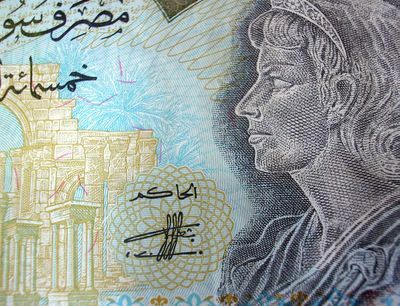 * Picture: Zenobia on the 500 Syrian Pounds note.